What Is Cheetos Made Of and Is the Orange Stuff On Cheetos Made Of Real Cheese? 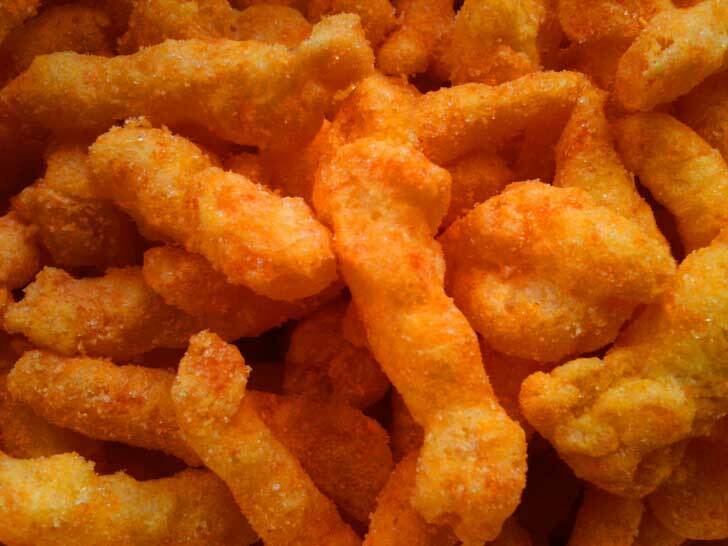 The orange stuff on Cheetos is a combination of various dyes and seasonings, and it’s the only part of Cheetos that has any cheese whatsoever in it. Like similar products, the main part of these “cheese” coated chip products is not cheese but a cornmeal concoction. The cornmeal, with whey and oil added, is mixed into a dough, then squeezed out into a long worm shape by an extruder. When the dough meets the cooler air, it sort of explodes or puffs, like popcorn. Blades cut it into bite-sized pieces, which are then fried. From there, the pale white morsels are shaken in colored and flavored powder. Real cheese, Yellow No. 6, annatto, and turmeric give the pieces that cheesy effect. A little more salt and vegetable oil are added for sticking power and flavor. Despite rumors, the powder coating on Cheetos is not toxic, but because it’s brightly colored and relatively loose, it can be lethal to furniture and clothes. What is the Difference between Processed Cheese and Real Cheese and How is Artificial Cheese Made? Where did Cream Cheese and Cottage Cheese come from and How are they made? Where did Mozzarella Cheese come from and How is String Cheese made?